Death, ascension and verification of the stigmata. 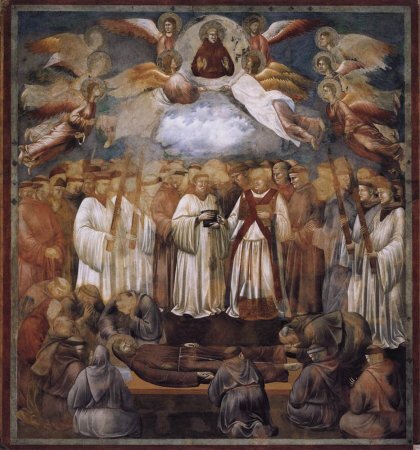 There are two images from Assisi here, as the Bardi Chapel fresco conflates two legends of Francis that appear in Assisi. The ascension is clearly not a physical one, as the body remains where it was, but the image is nevertheless a nod in the direction of the Ascension of Christ. The narrative of the image suggests that it is a vision, perhaps that of the kneeling friar in the bottom left who gazes upwards. 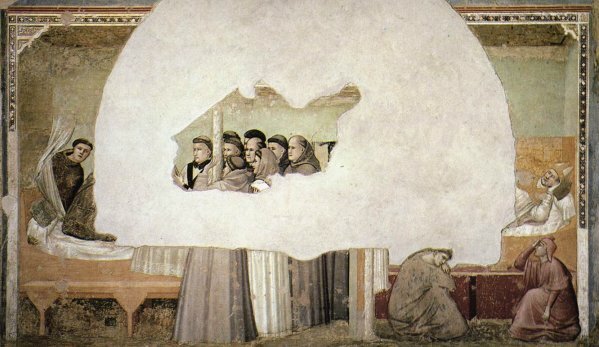 This is more clearly shown on the Bardi fresco, where a standing friar behind the head of Francis gazes up in astonishment. As you can see, the Bardi suffered damage when a monument against the wall was moved. The verification of the stigmata has another biblical reference: the story of Doubting Thomas. According to Bonaventure's Life of Francis, it was a knight, Jerome, who searched for the stigmata. The apparition of Francis to Fra Agostino and to Bishop Guido of Arezzo. This is the most badly damaged fresco in the Bardi chapel sequence. 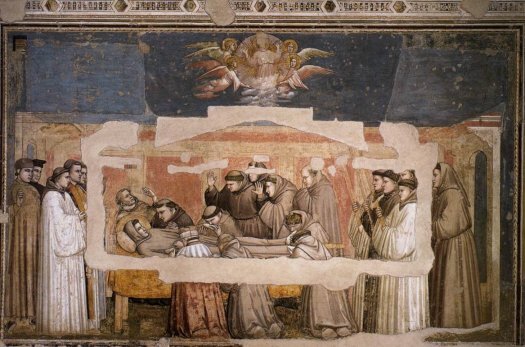 The legend tells that, at the moment of the death of Francis, he appeared to two important figures in the story of his life: Fra Agostino, provincial minister of the Terra del Lavoro, and Bishop Guido of Arezzo. But where is Francis? The answer for the Assisi fresco is straightforward. 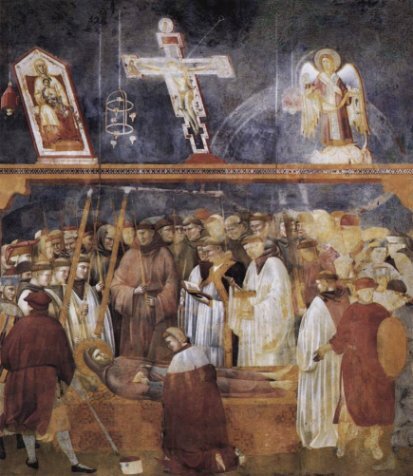 On the left-hand side of this fresco is the image of Francis's ascension, shown above. The two characters having the vision are both gazing upwards, directly at the image of Francis as it appears there. The obvious answer for the Bardi chapel is that an image of the apparition would be at the top of the fresco, now lost. 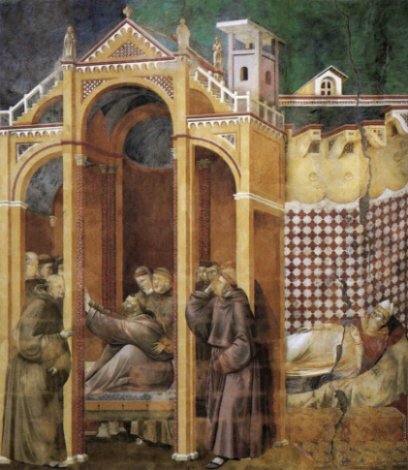 But Agostino is clearly telling the figures around his bed what he is seeing, to the astonishment of the friar behind him. One would expect these figures to be looking round to see if they could spot it. Perhaps the image is better without the apparition. Francis is telling the two named characters about his death: a private not a public message.